Kristina was drawn to Providence after years of traveling across the country, by land, river and sea, and living in Seattle, to be a part of the feminist art collective the Dirt Palace. 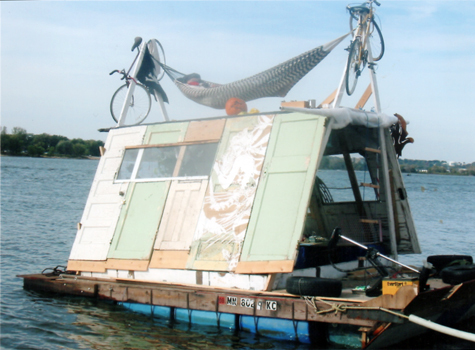 She left the Dirt Palace on a sailboat and returned from her voyage pregnant. Kristina is now putting down roots in Providence and navigating the transition into motherhood while working to maintain a sustainable creative practice. She likes to keep her mind and hands busy whether writing, drawing, printing, sewing or constructing objects and shelters out of wood and metal. She holds a BFA in Sculpture and a BA in Literature from University of Connecticut. Before the birth of her son she was working as a props and scenic artist/fabricator in local theaters. Since the birth of her son, she has been focused on community organizing and is a founding member of Libertalia, a radical community space and lending library, and initial organizer of Wild Child, a cooperative of parents who organize play groups, child care and, most recently, a zine focused on sharing stories and resources related to parenting.